Bay Leaf/Tej Patta/Tamal Patra is one of the most popular spice and is used in making pickles, sauces, marinades, soups, stews, meat dishes as well as relishes. Bay leaf is also known as Sweet Bay or Laurel Leaf as it comes from the Bay Laurel tree which is native to Asia Minor. The aromatic qualities of Bay leaf are so strong that it is also widely used to repel insects. This spice is mostly used in indian cooking and also in preparing aromatic perfumes. These leaves have a pungent and sharp, bitter flavor and fragrance which is somewhat similar to the cinnamon bark, but it is a bit milder. Bay leaf oil has many medicinal uses. As these leaves have a bitter taste, bay leaves cannot be eaten alone but are mostly used for flavoring in variety of dishes, both vegetarian and non-vegetarian. Roasted and ground bay leaves are an essential ingredient in the popular Indian mixture of spices known as “Garam Masala”. Bay leaf popularly known as “Tejpatta” in Hindi, ‘Masala Aku‘ in Telugu, ‘Birinji Ilai‘ in Tamil, ‘Karuvaela‘ in Malayalam, ‘Paththa‘ in Kannada, ‘Tej Patha‘ in Bengali, ‘Tamal Patr‘ in Gujarati, ‘Tamal Patra‘ in Marathi, ‘Tezpatta‘ in Punjabi. Bay leaves that are used in cooking belong to a wide variety of plants from different genera. Some of the common varieties of bay leaves used commonly are as follows. This type is Also known as Mediterranean bay leaves, these leaves are commonly used in Mediterranean cuisine. 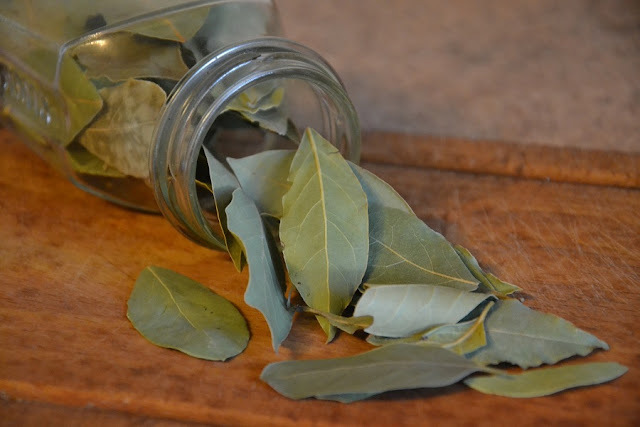 They use both fresh and dried forms of bay leaves to add flavor to soups, stews, braises etc. The fresh leaves are known to have a milder flavor and they take several weeks after drying and picking to develop their full flavor. this type of bay leaf is commonly known as California laurel, pepperwood and Oregon myrtle, it looks similar to the Mediterranean bay laurel but has a stronger flavor. The Indian Bay leaf looks similar to the bay laurel but tastes like cinnamon bark which is slightly milder. This bay leaf is Native to Indonesia, this variety is mostly used to flavor meats and less often used for vegetables. This variety of this spice is mostly used to produce a cologne known as bay rum. Bay leaf is one of the healthiest herb that help you promote digestion and treat digestive issues like heartburn and flatulence. It also provides relief from digestive disorders like irregular bowel movement, acid reflux and constipation. To aid digestion you can drink a concoction made by boiling bay leaf in water. The enzymes present in this spice breakdown the protein easily and avoid the risk of indigestion and acid reflux. To cure indigestion and bloating, just take 5 grams of bay leaves and a piece of ginger and boil it in 200 ml of water till only 50 ml water remains. Now once the mixture has cooled down add some honey to it and have it twice a day to get relief. Bay Leaf/Tej Patta/Tamal Patra are also a powerful ingredient for maintaining the glucose levels in diabetics. The antioxidants present in bay leaf help the body to process insulin in a better manner. Consuming powdered bay leaf for 30 days also helps in lowering the levels of cholesterol and triglycerides along with blood glucose. Many researches and studies on Bay leaf has also revealed that it reduces the plasma glucose levels and helps to treat diabetes. Bay leaf contains many medicinal properties that treat cold and other infections like cough, bronchitis and chest infections. To cure respiratory problems just boil some water and to it add 2 or 3 bay leaves and let it steam for 10 minutes. Now take a clean washcloth and soak it in this water and place it on your chest to get relief from respiratory problems. For ages bay leaf tea has been used as an home remedy to treat fever. Bay Leaf/Tej Patta/Tamal Patra is a powerful phytonutrients, which is highly beneficial for improving cardiovascular health and protects against diseases like heart attack and strokes. It also helps in boosting heart health as well as improves the functioning of heart. To improve cardiovascular health just drink a concoction made by boiling 3 grams of bay leaves and 3-4 grams of wild rose flowers in 300 ml water. Let this boil till only 75 ml water remains. Now strain this mixture and drink it once cool. Bay leaves are rich in antioxidants and organic compound like caffeic acid, quercetin, eugenol and catechins that help the body to fight free radicals, which in turn prevent the formation of cancerous cells in the body. The phytonutrient called parthenolide present in bay leaf has shown to specifically work wonders to restrain the growth of cervical cancer. Bay leaves are also popular for healing wounds and has been in use for centuries due to its antimicrobial activity that fights against the harmful bacterias like Streptococcus Pyogenes and Candida Albicans that protect and heal wounds. Not many people know this, but the bay leaves contains many calming and soothing properties that help you relax your mind and provide relief from day long tiredness, thus improves your sleeping ability. To get a sound sleep just mix a few drops of the bay leaf extract with water and consume it before bedtime. If you are conscious about your teeth and are looking for a natural way to get the sparkling white teeth, than brushing your teeth with powdered bay leaves can help you do that easily. Including bay leaves to your diet are the best way to treat kidney related problems and to get rid of kidney stones. For this purpose just boil 5 grams bay leaves in 200 ml water, boil it till only 50 ml water remains. Now strain and drink this mixture twice daily. This home remedy will stop the formation of kidney stones. From treating vaginal discharge to menstrual cramps and bloating, bay leaves are highly effective in treating several types of menstrual problems. When consumed orally, it also induces the normal and regular menstrual cycles. Bay leaves work wonders when taken 3 months before and after pregnancy. Due to the rich content of folic acid in bay leaves, it also helps in preventing birth defects in children. Bay leaves contain natural soothing qualities, which lowers down the stress level hormones and maintain the level of Oxytocin in the body. Bay leaves are also widely used in aromatherapy due to its ability to provide relief from anxiety and stress. Bay leaf oil is known to have powerful anti inflammatory properties which help to reduce the pain caused by sprains, arthritis, rheumatism, strains or any other body ache. In case of an headache or migraine, massaging with bay leaf oil provides instant relief. This might surprise you, but using bay leaves for hair naturally moisturize your hair and offers it smooth shiny and silky hair. This herb can also help you promote hair growth. Our scalp is the most sensitive area of the body which easily get infected if not taken proper care of. So in order to maintain a healthy scalp, must use bay leaf water to rinse off your hair once in a week. Powdered Bay Leaf/Tej Patta/Tamal Patra when mixed with curd work wonders in treating dandruff. All you need to do is to make a paste of powdered bay leaf and curd and apply it onto the scalp and leave it for 30 minutes. Wash it off after 30 minutes with lukewarm water. Having head lice is one of the most annoying problems and can embarrass you quite often. Using bay leaf water for rinsing hair can help you get rid of head lice as well as provide you a healthy scalp too. To treat head lice just boil about 50 grams of crushed bay leaves in 400 ml water and let it boil till only 100 ml of water remains. Strain out this water and apply it on the hair roots and let it sit there for 3 to 4 hours and wash it off. Bay Leaf/Tej Patta/Tamal Patra are the best way to improve the skin tone and to get clear and smooth skin. All you need to do is to boil some bay leaves in a glass of water and use this water to wash off your face. The antiseptic, antibacterial and anti-fungal properties of bay leaves kills the bacterias that cause pimples and acne and treat them naturally. Many studies and researches conducted on Bay Leaf/Tej Patta/Tamal Patra revealed that the antioxidants found in Bay leaves are highly effective in offering radiant and youthful skin. You can also use boiled bay leaves water on the face to make your skin look glowing and beautiful naturally. Rich in anti-inflammatory and antibacterial properties, bay leaf work as a great detoxifier when used while taking bath. It detoxifies your body and helps to remove all the harmful toxins present in your body naturally. Bay leaf helps to reduce the stress on your skin which in turn helps in preventing the appearance of wrinkles and other signs of aging. To destress your skin just boil 5 dried bay leaves in 2 cups of water. Once it starts to boils remove it from the heat. Now using a towel cover your head and inhale this steam. Inhaling this steam works to destress your facial skin, bringing out a natural glow. Bay leaf is well known for its healing properties. For ages it has been used by herbal practitioners for treating snakebite, insect stings and even cuts and bruises. The antifungal and anti-bacterial properties of Bay leaf oil works amazingly to cure skin infections. This oil can be applied topically to heal cuts, bruises and insect bites. Bay leaves are high in nutritional value and offers many essential nutrients and minerals to the body. It also contains many vital minerals like calcium, iron, zinc, selenium, potassium, copper, manganese, etc. It is also packed with volatile oils and phytochemicals that offers uncountable benefits to your body, hair, as well as skin. Now that you know how this one herb can change your overall health and lifestyle, you should definitely incorporate this herb to your daily diet. Its rich iron content also promotes the cell formation in the body and help you regulate body metabolism, which in turn optimizes your health and provides you healthier and better lifestyle.